Yves-Alexandre de Montjoye is a PhD student at the MIT Media Lab. He engineers stochastic tools to harness the power of large-scale behavioral datasets, such as human movement data, financial transactions, and communication patterns in networks. He also showed how the unicity of human behavior individual's privacy in Big Data. His research has been covered BBC News, CNN, The New York Times, Wall Street Journal, Foreign Policy, Le Monde, Die Spiegel, in reports of the World Economic Forum and United Nations, as well as in his talks at TEDxLLN and TEDxULg. Before coming to MIT, he was a researcher at the Santa Fe Institute in New Mexico where he used cell phone data to model the dynamics of urbanization in developing countries. Yves-Alexandre worked for the Boston Consulting Group and acted as an expert for the Bill and Melinda Gates Foundation and the United Nations. Over a period of 6 years, he obtained an M.Sc. from Louvain in Applied Mathematics, an M.Sc. (Centralien) from Ecole Centrale Paris, an M.Sc. from KULeuven in Mathematical Engineering as well as his B.Sc. in engineering at Louvain. 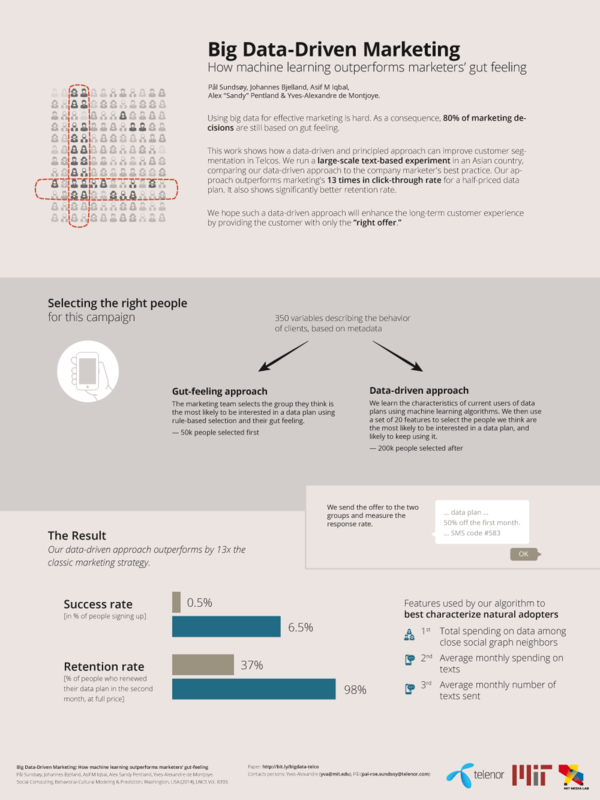 "Big Data Driven Marketing: How machine learning outperforms marketers' gut-feeling"